My brother chows down his chili frank plate while ignoring me. In Hawaii, we know exactly where we’re headed to when prom night ends. After hard clubbing, we flock to one place for food at 3 AM. When all other breakfast joints have firmly moved on to their dinner menus, you’ll find us here satisfying our cravings of pancakes and omelettes at all hours of the day. Spam is on the menu. Permanently. Local Tip: Refuse to eat spam? It’s OK, I forgive you. Try the Portugese sausage instead. Besides breakfast being available 24/7, so is lunch and dinner. Want a deluxe teriyaki burger with fat french fries, extra ketchup, and a large soda at 5 AM? Go for it. This place was made for you. It was also made for seniors. I’m not talking about retirees in their 60s. I’m talking about the wrinkly, white-haired, 70s-but-pushing-90-years-old population of Hawaii that naturally wake up at 4 AM and are in bed at 8. More than the food, they’re here for the waitress who’s served them faithfully for the past 10 years. 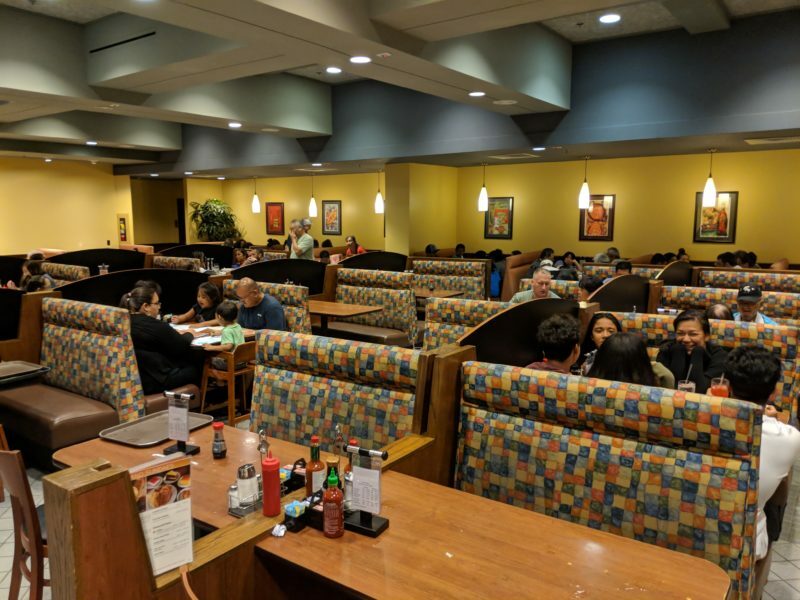 Zippy’s is a local chain restaurant that’s been around since the 1960s and from the very beginning the Higa brothers focused on local comfort food. What makes it so great is that they do a huge range of favorite local dishes. 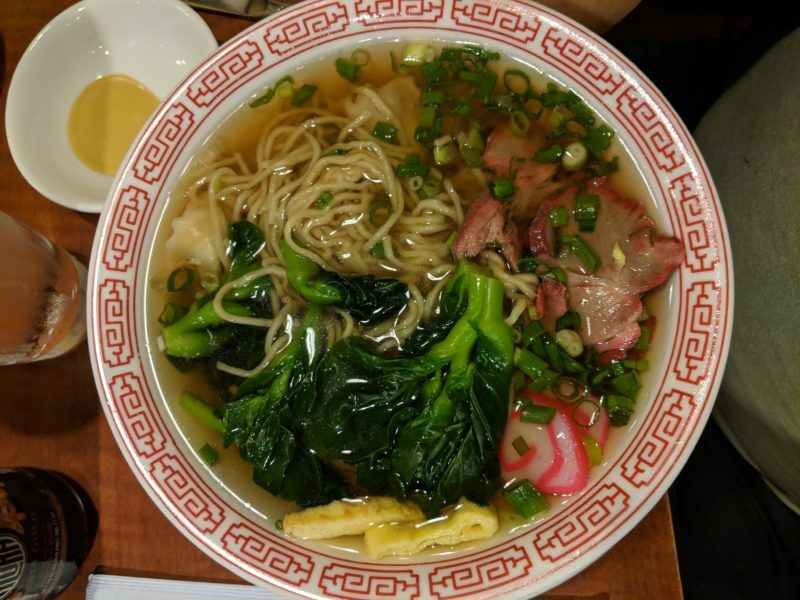 My parents and grandparents grew up with a Zippy’s that was a one-stop shop for what families around them ate: Chicken long rice, oxtail soup, saimin, their famous chili and plate lunch entrees. But my generation eats at Zippy’s because these everyday dishes have endured and are now iconic local food representing all of Hawaii. Zippy’s continues to add to their selection. When a dish has proven itself to be local for a good length of time, it will pop up on the menu. A perfect example was the malasada – the fluffy and deep-fried Portugese donut dusted with delicate sugar crystals has earned its spot on their bakery’s desserts and it’s going strong. It’s a neat tale of time, isn’t it? There aren’t many people who won’t eat nachos. It’s so easy to have them just the way you want. Onions? Green onions? Cheese? It’s up to you. But chips with Zippy’s famous chili? Now we’re talking. If Zippy’s was known for just 1 thing, it would have to be their chili. They sell them by the bucket and you can even buy them frozen from the store. Their chili is on the creamy and slightly sweet side, but with all that ground beef and beans, it’s plenty savory. The Zippy’s menu is endless in chili combinations, too. Chili with rice, chili with cornbread, chili on a burrito, chili frank plate…the list goes on and it may be too hard to choose. They also have no-bean chili and vegetarian chili – both are delicious. Local Tip: The usual way they serve chili on rice is in the same bowl. But if you need something a bit more filling, request each in their own bowl so you get a little more. There are plenty of people who request it this way, so no shame. Also, if you love your runny eggs, add an over-easy egg to the top, sprinkle some pepper and a splash of shoyu – it will knock your socks off. It isn’t uncommon for the Zippy’s chili buckets to show up at potlucks. So if you are ever invited to a local’s house for dinner, consider bringing a small bucket. A lot of families here love their white rice and Zippy’s chili is excellent with white rice. 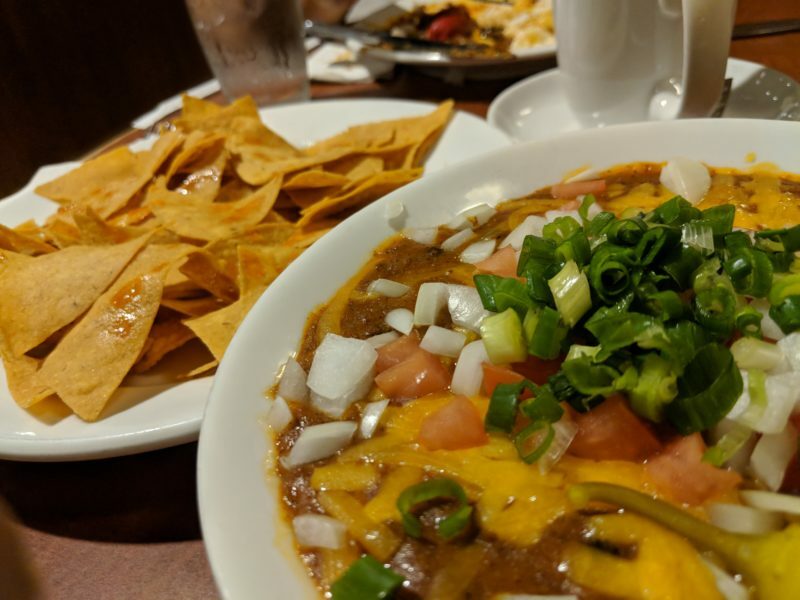 If you’re eating at the restaurant though and chili nachos is what you’re craving, here’s how I order them: toppings on the side and the chips on a separate dish. Then I sprinkle tabasco on the chips and WOW that adds a nice kick and flavor to each bite. The chips are a bit thicker than the ones you’ll find at Mexican restaurants. There’s less of that light snap and more of a heavy crunch. Zippy's chili nachos is what I order 9 times out of 10. 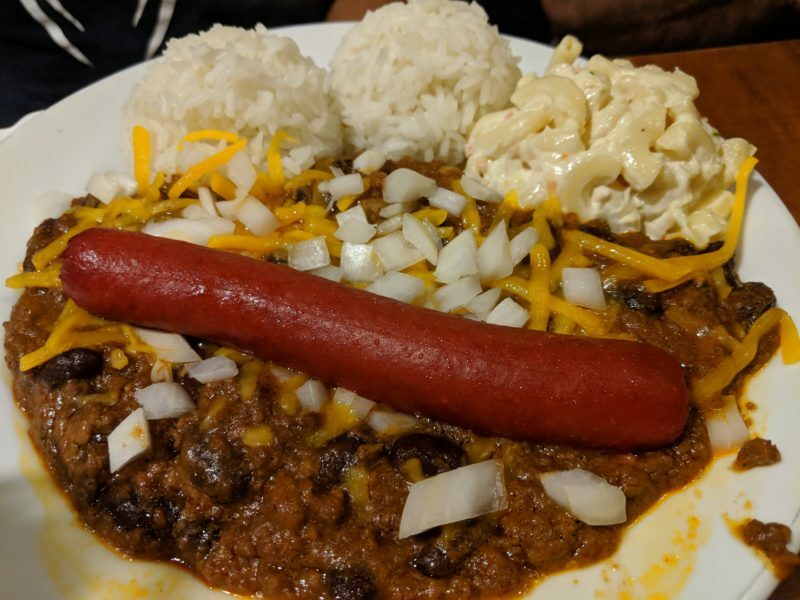 My brother's chili frank plate with Zippy's signature red hot dog. My Grandma has dementia. We’ve known about it for awhile now and we’re actually really lucky because we can still entertain her easily by putting on Japanese TV shows. Like with most patients with dementia, it’s hard for us to take her out to eat because we don’t know how she’ll behave. But we will take her to Zippy’s and she enjoys her saimin to the fullest. The word “saimin” usually doesn’t register for her. But once that bowl of hot soup and noodles is served, her memory gives a kick and she can slurp those noodles down like a pro. The other reason why we’ll bring her to Zippy’s is because the servers are used to it. Zippy’s is the local hangout for the elderly. The food is familiar, the floor plan at each restaurant changes little, and while all else fades from their minds, eating at Zippy’s is a habit. A story on dementia: Ever have an old lady in her 80s say, “oh, you’re so fat,” or “oh, you’re so black,” to you? Yeah, it’s pretty embarrassing when your grandma says that to a complete stranger when you’re right next to her. But let it be known that she says it without a mean bone in her body. Instead, her brain has resorted to a childlike state and she’s lost all inhibitions and social etiquette. Any grandkids out there with similar stories like mine? What’s neat about Zippy’s saimin, is that it’s served “local style” with a small dish of Chinese mustard. Rather than hot sauce that steamrolls over your tongue, Chinese mustard shoots up your nose like wasabi. Don’t go pouring this into your bowl to be brave. Instead, pour twice the amount of shoyu into the dish and mix with your chopsticks (yes, Zippy’s will give you chopsticks with your saimin, but I won’t judge you for asking for a fork). Some locals like to pour as they go, but the common method seems to be dipping the char-siu or vegetables and dipping it back into the broth to spread it around. Or you can be like me and create that perfect bite on a spoon and dab a bit of mustard on top. Local Tip: I recommend telling your server that you like the soup extra hot. The broth is made in large quantities but cools down with every scoop of the ladle. If I don’t ask in advance, I find myself returning the saimin and requesting the staff to blast it in the microwave. I’m not a picky eater and an extra 2-minute wait is fine with me. Dad's wonton min if you're in the mood for dumplings. My aunty prefers the original saimin. Almost every single Zippy’s has a Napoleon’s Bakery and if you haven’t been, it’s a good place to get your bearings for local pastries and delights. Kids love their guava chiffon or chocolate dream cakes for parties. The coconut haupia is excellent if you have haupia on your bucket list. Their pies are popular among coffee drinkers and their apple pie is great hot with a scoop of ice cream. The pastries is an entirely different world of danishes and donuts. Everything from malasadas to apple napples to long johns – it will be hard for you to choose just one. Once in a while we’ll order a box of favorites to last at least a few days for breakfast. Local Tip: The apple napples are very popular. Zippy’s will usually have enough (demand is high), but it’s common for them to be sold out near the end of the day. If a slice of pie or cake isn’t what you’re craving, order a hot apple napple with ice cream for dessert. 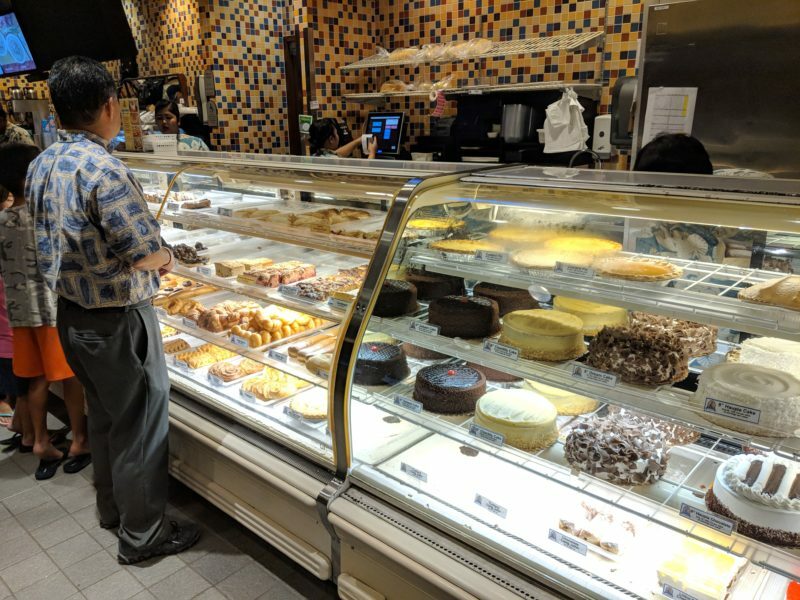 A few other desserts that you won’t see at other mainstream bakeries: The Chinese jin dui, Okinawan andagi, a variety of malasadas – a Portugese donut, and the Japanese an-pan filled with sweet azuki bean. Zippy's is truly a one-stop shop for food, parties, meetings and desserts. The battle of best cake: Mom loves her dobash. 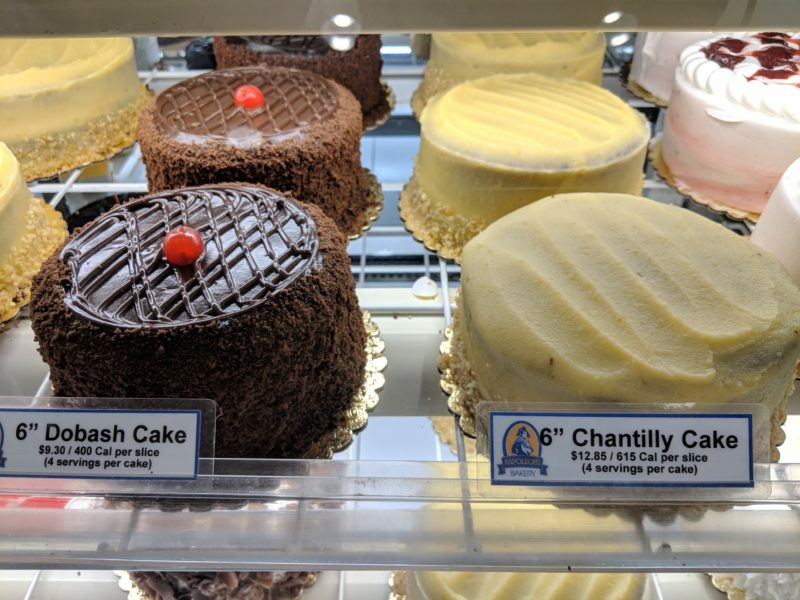 I find the chantilly irresistable. 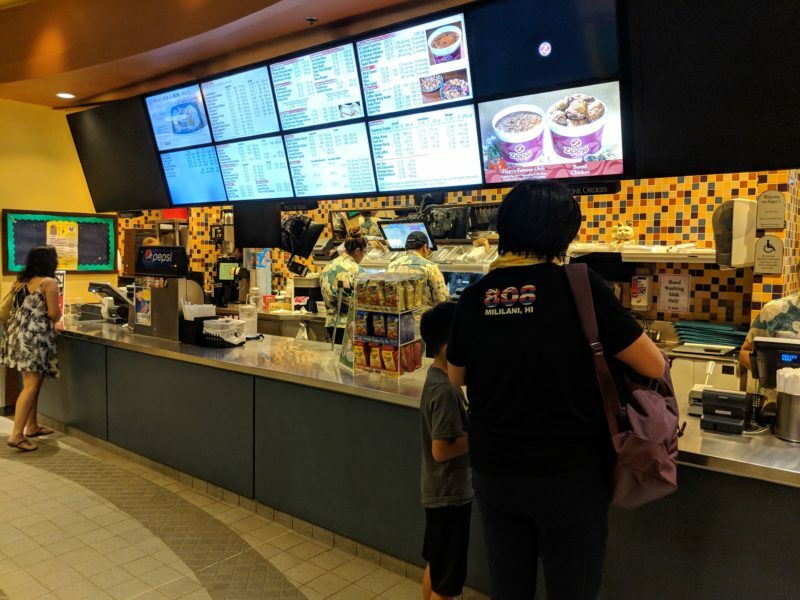 Almost every Zippy’s has 2 sections: a service area complete with booths and servers and the self-service area where you take your food to your table or order take-out. Prices will vary between the 2 areas. Usually the self-service menu is slightly cheaper, but I’ve also seen it the other way around sometimes. Expect the kitchen to break on holidays, rainy days and when there are large events nearby. There’s often an overflow of customers on these days and while I’ve found Zippy’s service to be acceptable, I’ve seen the horror stories online about long waits and no food. Take it from my Mom, a Zippy’s waitress for almost 20 years. It’s common for Zippy’s to have a toy dispenser for kids. Your kids can ask for a free coin on their way out and have a toy pop out. Sometimes they are broken for a looooong time though (come on, Mililani Zippy’s). The fried chicken is pretty good, it’s a popular favorite. But ask for a freshly-cooked one because the cooks will often deep fry a few in advance and let it drip dry before the order even comes in. Ordering from the self-service side. The service side for dinner is beginning to get crowded. Zippy’s is an interesting spot for a traveler to visit. It’s a local spot without the tourist additions, “local” in its purest form. If you’ve been to Zippy’s, let me and others know what it was like. I’d love to hear what your experience was like. If you want more info on Zippy’s, check out Lavonne Leong’s article on what makes this local restaurant so special. 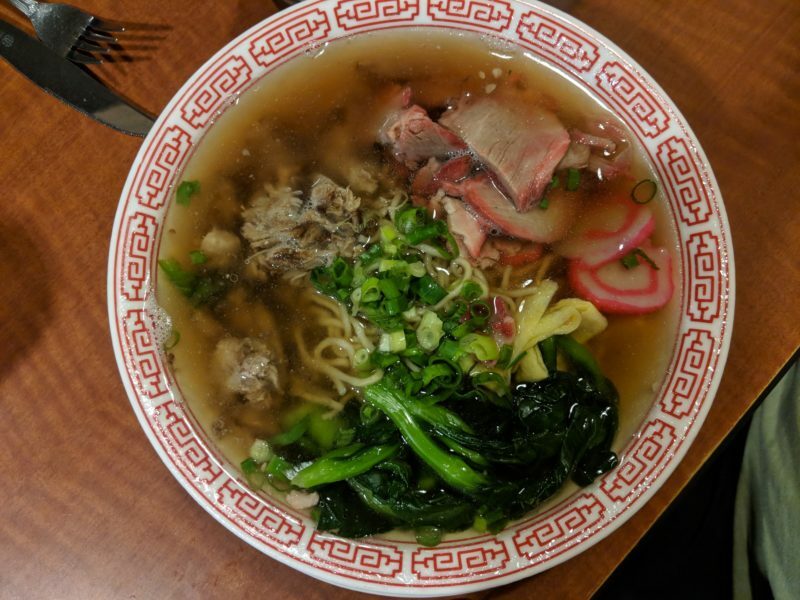 Or if you can’t get enough of Zippy’s saimin and Chinese mustard, you might want to check out Shige’s Saimin where they make fresh noodles daily. 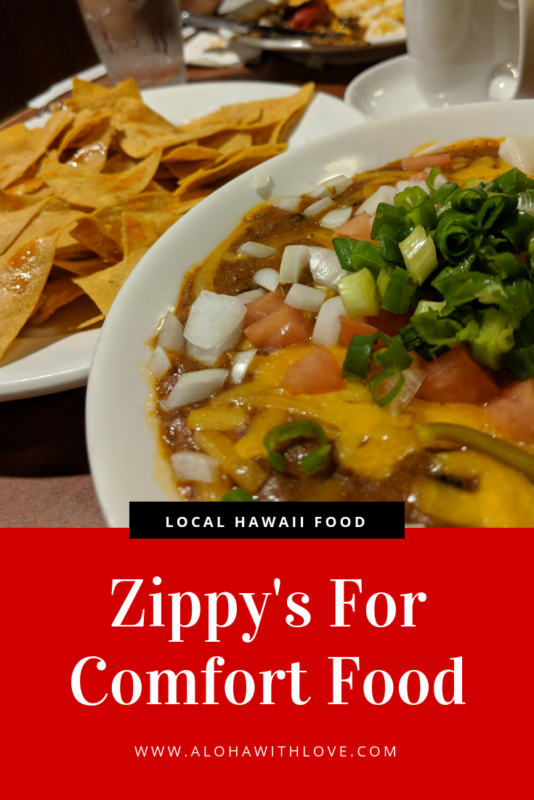 If you enjoyed this article about Zippy’s and plan to visit Hawaii someday, sign up below to get my local Hawaii tips. It’s free and I can’t wait to help you plan the perfect Hawaii vacation.